This car runs on hot air and broken promises. It has three wheels that speed the vehicle through tight left turns. 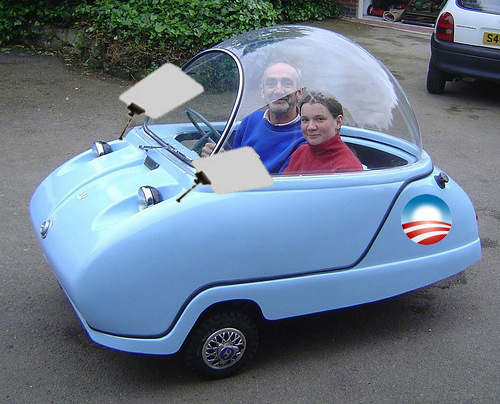 It comes complete with two TelePrompters programmed to help the occupants talk their way out of any violations. The transparent canopy reveals the plastic smiles still on the faces of all the "happy" owners. Comes in S, M, L, XL and 2XL It won't get you to work, but hey, there aren't any jobs anyway!